Mark Samuel Cooper was born Fenruary 14, 1960 in Camden. His family moved to South Florida when he was a boy. He played football and basketball, and also starred for the track team at Miami Killian Senior High. Mark stood 6’5” and weighed nearly 250 pounds in high school, but had the speed to star at tight end. He and quarterback Mark Richt were the Cougars’ two best players. Mark was an All-City blue chip recruit, pursued by several colleges. He decided to stay local and accepted a scholarship from Miami, whose coach, Lou Saban, personally recruited him. At Miami, Howard Schnellenberger replaced Saban and moved Mark from tight end to the offensive line as a junior, and his career took off blocking for Jim Kelly. The Hurricanes went 9–2 in 1981 and 7–4 in 1982. Mark earned Player of the Game award in victories over UNC and Notre Dame, and Second Team All-America status as a senior. In the 1983 NFL Draft, the Denver Broncos used their second pick on Mark. He roomed with fellow rookie John Elway his first year in the league. The team’s offensive coordinator was Mike Shanahan, who later became head coach. Mark considered him the best head coach he ever played for. Mark played right behind veteran Keith Bishop, starting a handful of games each year. In 1986, the Broncos won the AFC title. Mark started at right guard in Super Bowl XXI against the Giants, which Denver lost 39–20. 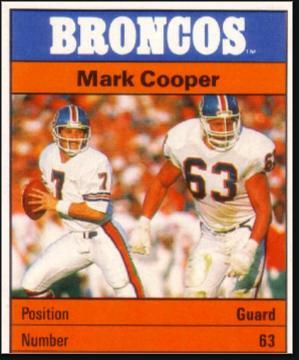 Mark split the 1987 season between the Broncos and Tampa Bay Buccaneers, where he blocked for an old college teammate, Vinny Testaverde. He also played some tight end and contributed to special teams. An avid fisherman and diver, Mark was just happy to be playing in his old home state. During the off-season in 1989, he proposed to his girlfriend, Nancy Parker, 70 feet underwater during a trip to Barbados. Mark got into the starting lineup and was having a solid season in 1989 when an injury ended his season. At age 29 he retired from the NFL. He and Nancy moved to Denver and got into the real estate business. He became a tournament fly fisherman and also writes articles for outdoor magazines.